How do you celebrate Easter? When I was small, I went to Easter egg hunting events for kids. The eggs were real-but-bright-red hard boiled eggs. The same kind of eggs with the ones I saw in kids’ birthday parties. That was back when I still lived in Java. Later on after I moved to Canada, these Easter eggs were not bright red hard boiled anymore, but they transformed into chocolate eggs with various different fillings, wrapped in colorful packages. But this year in Sydney, we went to an Easter celebration that is not themed around eggs. The event size was also much more massive than anything Easter related that I’ve ever been to. Imagine a massive two week long full fledged carnival, amusement park, and agricultural show all combined, that has been done every Easter since 1823, and that Queen Victoria herself awarded the right to use the word â€œRoyalâ€ in the event name. 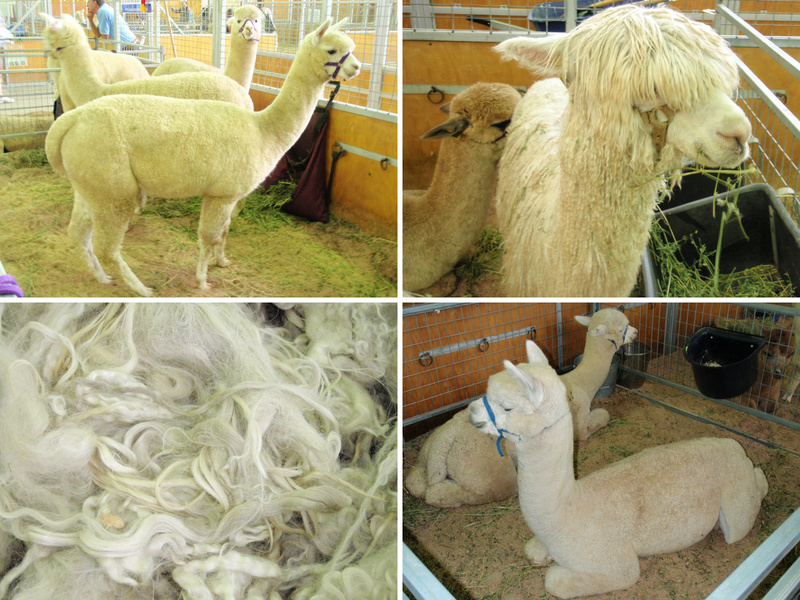 Ladies and gentlemen, let me introduce to you: the SYDNEY ROYAL EASTER SHOW! Marked as the largest annual event in Sydney, currently this Easter Show attracts one million visitors per year. What will you find in such a massive event? There were about 15 000 competitors displaying their very best breeds of farm animals, fruits, flowers, food, and various kinds of arts and crafts. There were various farming demonstrations such as sheep shearing and cow milking. There were clumps of amusement parks, with a lot of thrill rides that bring you upside down from slow motion to fast launch. There were food stalls and a big outdoor stage. Many standard carnival games with large prizes and vendors selling items from Shamwow to magic tricks. The Olympic stadium in the location hosted a stunt show, demolition derby, and fireworks. And they sell the things that every visitor here want to desperately buy: SHOWBAGS! The big deal! I’m sure y’all have heard about it! What, no? Well, then you just wait, I will explain that to you soon! Now, let me bring you to our highlights of the Show. We spent quite a bit time around the best breed collection. 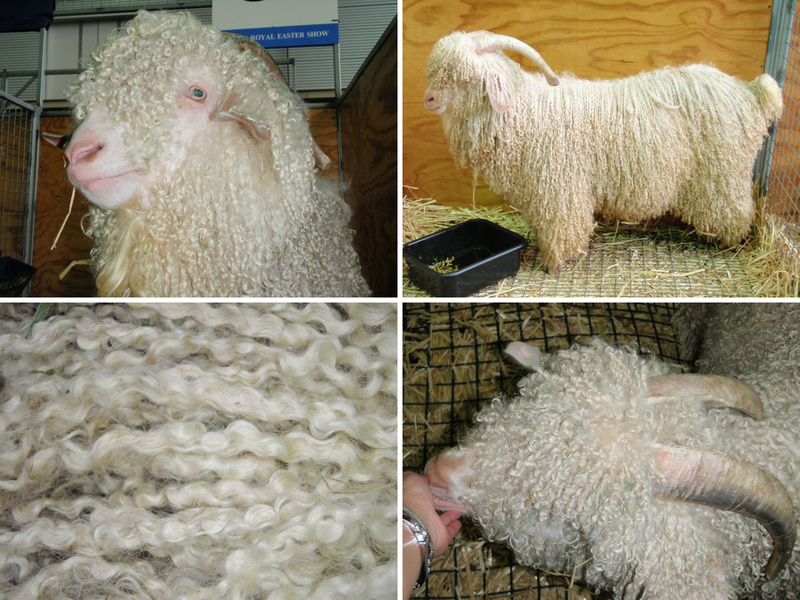 I’ve heard about angora goats before, but this was the first time I’ve seen them up close. Their hair is much longer and prettier than I thought. The curl is just perfect. Angora or not, a goat is a goat, they eat cans and everything else, like chewing my fingers (see the right-bottom photo) and my purse (unfortunately no picture for this one). We enjoyed our first close contact with alpacas. They are very shy, unlike the angora goats. Most of them moved away when we came to them. One brave alpaca decided to sniff me, and shook his head with a disgusted look on his face. Duh! I was hoping to make friend with them. Have you seen how a horseshoe is installed? It’s pretty neat. The farrier (horse shoe master) will go back and forth to the anvil and the horse to shape the U iron match with the horse’s hoof, then he will hammer several nails passing the iron shoe to the hard hoof to secure it to position. The whole time he will keep checking and adjusting to ensure the shoe is being installed nicely. We were happy to be able to see this process up close. The world tallest horse? They had one a full 20.0 hands tall here! His name is Noddy, short from Luscombe Nodram, and he is a handsome 7 years old horse from Queensland. I’ve never heard of “hands” used as a measurement before but apparently 20 hands is about 2 meters. The art displays were okay. I liked some of the decorated cakes, and 2 paintings drew my attention. One being a boy wearing superman costume, hanging on the light’s chain, the other being the replica of the Girl with a Pearl Earring, but this one has Coca Cola writing on it. I’m not sure why. The produce displays were delightful. They are large displays of fruits and vegetables around some themes. 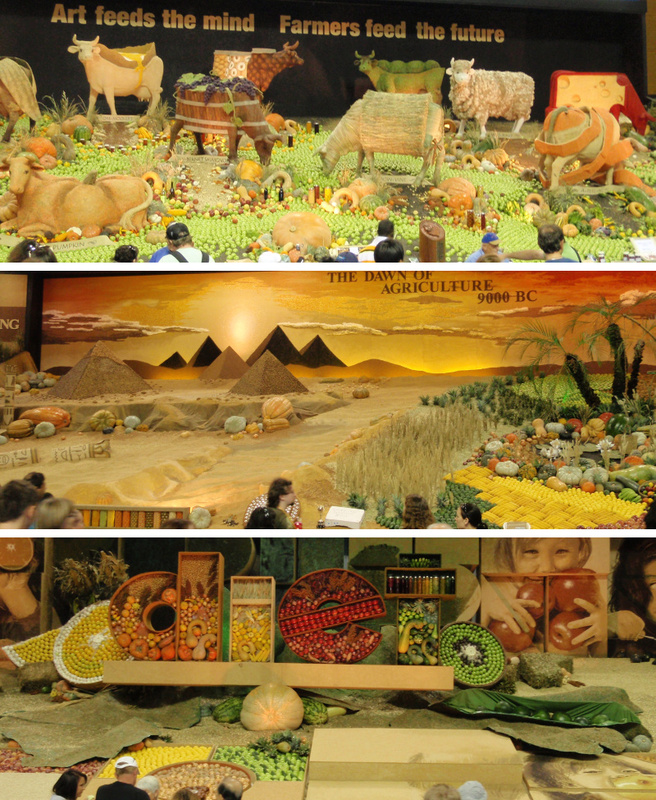 My favourite theme is the cow farm, having the fruits and vegetables decorate the ground, and the cow figures were designed to interpret some fruits. Men and women alike were showing their strength in the wood chopping competition. The task is to chop in half the block that they are standing on. Contingents were from various states of Australia and some countries too like Canada, New Zealand, and United States. We cheered for the Canadian competitors but they didn’t seem to do very well. Here and there you can see bunch of old timey freak show posters, unfortunately without the freak shows themselves. 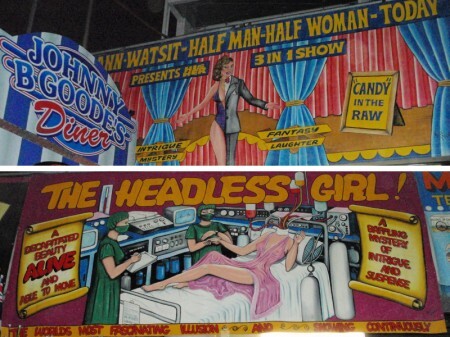 A headless girl? Creepy! Thrill rides are a must in a carnival, and they have so many of them. You can choose many ways how you want to be flipped upside down. Now of course I need to mention about an Australian carnival favourite, the showbag. First, tell me whether you have heard about the showbags before or not (and whether you are Australian or not!) When I heard the term showbag, it didn’t mean anything to me, never heard that term before. But for many that come to this show, shopping for showbags is one of the main attractions in this Easter Show. So, what is this big deal about? A showbag is a themed bag with bunch of knickknacks inside it, a mixture of light edibles, like candies and chocolates, useful items like bags and bottles, unsold products like old magazines, samples of toiletries, magic tricks, funny hats and hair accessories, even costumes. A large hall was dedicated to the showbags, absolutely packed with people, their arms weighed down with all the showbags they’d bought. 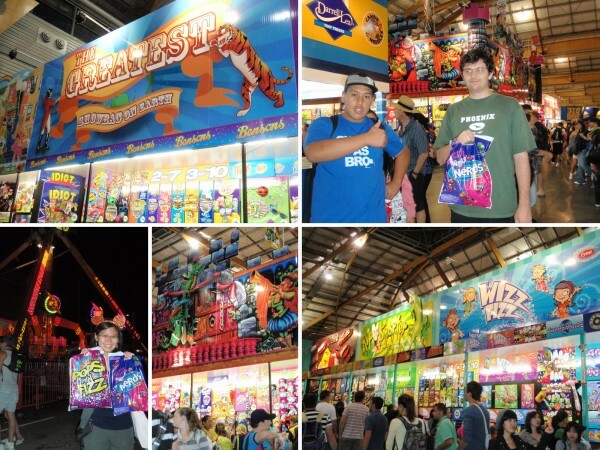 Plenty of brands are participating in this showbags event: food and drink product such as Cadbury, Wonka, or Coca-Cola, from TV-shows, games, and other popular icons like the Simpsons, Family Guy, and Pokemon. Womens’ and mens’ magazines, novelties, costumes, toys… all sorts of junky stuff that is probably going to break as soon as you get it out of the package! These items are packed according to their themed inside a shopping bag with design according to the theme, for fix prices. It’s fun to open this colorful bag and then see what colorful thing you got inside. We only ended up with 3 cheap showbags, but every body else hauling a large number of them. Teenagers are crowding empty corners, they sat on the ground and open all of their show bags and start enjoying them. Even later on when we went home by the train, we saw many people inside the train and on the platform checking out their showbags. I think it’s as thrilling as opening Christmas stockings in the morning, except that you choose the showbags yourselves instead of letting Santa do it for you. We closed our day by watching the car and motorcycle stunt shows. This was conducted in an ex-Olympic games stadium. This place was actually really full that night, we were not even able to get a seat. We ended up perching on a railing packed in with all the other folks who showed up too late for a seat. The motorcycle acrobatics were great, showing 4 riders doing many different kind of somersaults in the air with their motorcycles. They had the fire-blowing car-chewing giant robot too, but he walked awfully slowly between the cars he was eating. Fun to see the first few minutes, but it got too long and dragging. We left as the giant car chewing robot moving to its second target. As we walked left the stadium we saw the fireworks display capping off a great day at the Sydney Royal Easter Show. So, have you ever gotten a showbag? Any fun carnival stories to share? Post a comment! Easter is really a non-event here in Korea. The university gave employees a little gift bag with two boiled eggs inside. (rolling eyes). Your show bag sound like a lot more fun. .-= Nancie (Ladyexpat)´s last blog ..Wanderfood Wednesday â€” Andong Jimdak =-. Nancie: hahaha, I hope you enjoy the boiled eggs! Those bags are fun indeed, even though probably I don’t need that much sweets! Oooh, I want the Hello Kitty showbag! Haha…looks like tons of fun, and makes me think I need to plan to spend an Easter down under but then I would miss my favorite thing about Easter – See’s Candies chocolate bunnies! So yummy! .-= Ashley´s last blog ..List of Free Days at Oakland Museums =-. That seems like quite an event. And the angora goat looks amazing, sort of like a mini-yak. I’m surprised to hear that there’s no event in Mexico, I thought they are quite religious? I’ve actually seen white-haired yaks in Northern India and they didn’t strike me as too intimidating. Haha…I love yaks so I will defend them at all times! And I was surprised as well that nothing was happening here in Mexico. The people are quite religious but apparently they skipped out on celebrating Easter this year! .-= Earl´s last blog ..My Asylum From The Insanity Of Travel =-. it much taller is that stands up w/ two legs only. Oh! Have you seen this one too? Unfortunately it was not standing on 2 legs when we saw it.